In early May I lectured to the Town & Country Garden Club of Newtown about roses. It was quite a kick to hear myself introduced as a rose expert. I’m sure the folks at Elizabeth Park would beg to differ–but I digress. My topic was Easy Care Roses–because I often speak of myself as the laziest gardener on the planet. That’s not quite true, but I am one of the most time-pressed gardeners that I know. I also don’t believe in coddling plants. And of course I don’t believe in any chemical pesticides or fungicides. But I love roses–and for awhile I thought that I wouldn’t be able to grow any. Then I found the shrub roses that at least resisted the need to be winter protected. My earliest ones weren’t exactly “easy care” in the sense that they didn’t get insects or disease that disfigured them–but they came roaring right back after infestation, grew less than 2′ from the road (in that same bed with the lilac I posted about last week–they too withstood snowplow damage!) and can withstand they heavy wet snow that the snowplows throw at them all winter along. What more could I want? A lot actually. There are some trademarked roses that do even more. You see one of my favorites, above, along with a couple of new ones that I’m testing under some extreme conditions this summer. I’ll talk about each individually over the next month (as well as the practice of “trademarking” roses and what that means for gardeners, generally). I’ll be lecturing again in August, again on Easy Care Roses, down in North Stonington. I’ll be bringing these same roses (I hope). That will be the ultimate test. 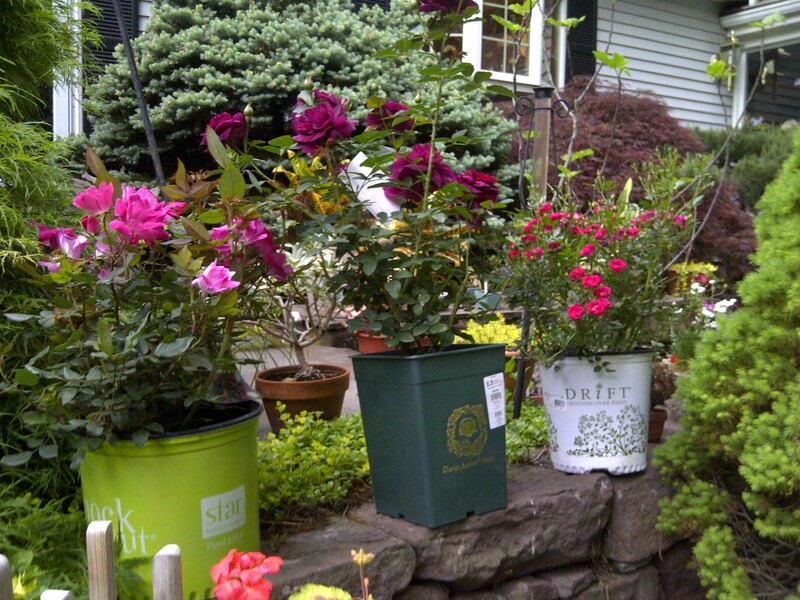 If a rose can survive in a container and look good all summer, that means it really is “easy care.” We’ll see. we need more people like you who actually garden in the real world (it gets wet, cold and sometimes salty, lol)and test out the roses in conditions most of us have to face (except the fortunant ones who live in the south or ideal condtions of not to cold or wet or to dry, haa, where is that i ask?) I really get frustrated by the catalogs that say it is hardy to zone so and so only to buy it and it is hardy alright right down to the ground and it won’t bloom much as it hates the wetness, or the cold and hence it never achieves what is promised. they bait you with the beautiful photos of the roses only to forget ot tell you it hates the cold you have to spray heavily and the canes are not hardy either and the flowers can’t stand to get wet or they turn brown. yikes, I have spent ot much money doing my own experiements without actually thinking I was doing that. lol. Thank you and thanks for reading! It sounds as if you love roses and have been a bit frustrated by them. Fear not! There are lots that are hardy–you’ll see a bunch more coming up this month on the blog (and I’ll tell you which ones that promise to be hardy but which I’m not loving so much either). I know exactly what you mean about the beautiful photos–or right about now I’m driving around and seeing all these lovely roses in other folks yards and I’m lusting after those! But I know what is and isn’t going to work for me and that’s what I try to share. Sometimes gardening is a lot of trial and error–I can’t tell you how many plants I’ve killed myself. But it’s so nice if we all learn from each other. It takes some of the “trial” out of it!